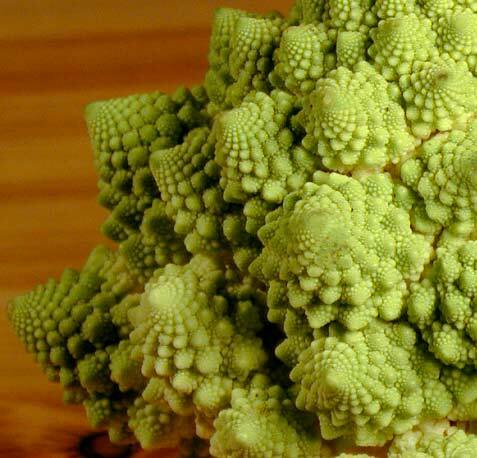 You’d be hard pressed to find a trader that didn’t have at least a vague awareness of fractals. After all, every high and low created in a chart is a fractal pattern of some degree. If you’ve ever set a stop below some recent lows on a chart you’ve used fractal analysis in your investment/trading decision making process. My definition of a fractal may not be identical to yours but my goal is to harness some of the messy data that the stock market churns out day after day and minute by minute and extract some useful rules to guide the decision making process. 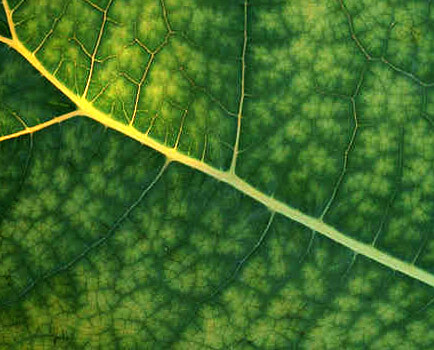 Fractals are inherently unpredictable yet generally follow deterministic rules based on nonlinear iterative equations. They create self-similar, repeating, non-symmetrical patterns and shapes. Markets appear self-similar over multiple timeframes the same way that a fern looks self-similar at different magnification. The difference is, there is no formula for the stock market like there is for creating a fern. 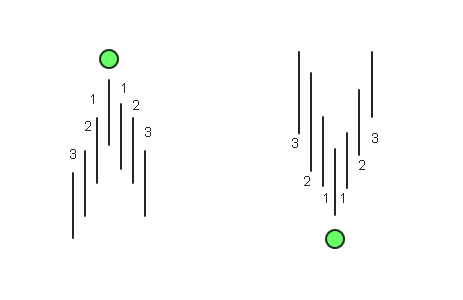 Markets are simply not the same as these observable natural patterns — yet they are similar. The market is an incredibly messy process. The balancing of supply and demand is up to the many participants, each possessing different levels of skill and sophistication, each acting on unevenly distributed information while working towards uncommon goals. This process is what leaves the footprint of the market which appears to be moving intelligently on all time frames. Which tends to generate a lot more noise than the relatively simple pattern of the stoic fern leaf. In order to start making sense of fractals you first have to identify them. Veteran traders can usually just see them. Patterns and shapes pop out to some people. Some of us are particularly impaired with the bias called Apophenia, the experience of seeing meaningful patterns in random data. Take this chart for instance. You can instantly see the shape. If two humans are watching this chart they will both come up with relatively similar important data points. While you may be able to see the patterns. Quantifying them and monitoring a lot of them is another story. Plus we know that we need quantitative data to try and short circuit our biases. In order to do that we need to have a computer read the data, so you have some simple rules. There is a very easy way to do this. All you need to do is search for a true high or true low of a bar and look at the bars preceding it and following it. Take a look at the image below. You can see on the left that there is a high with three bars on each side which do not exceed the true high of the highest bar. On the right you can see that there is a low with three bars on each side which do not print below the true low of the lowest bar. These are both examples of a ‘3-bar fractal’. 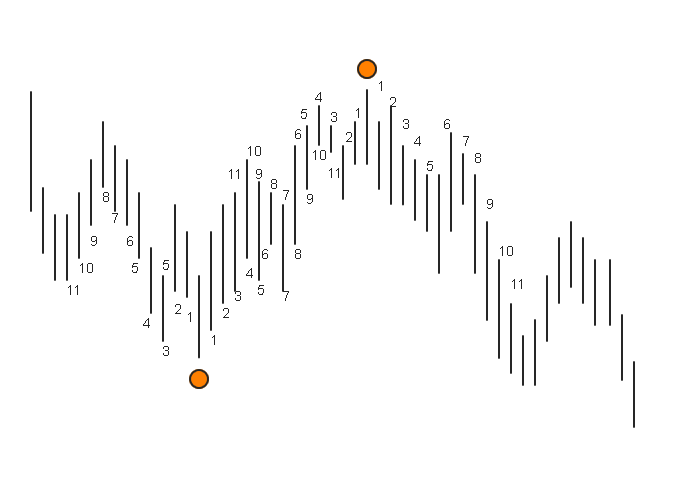 ‘N-bar fractal’ refers to the N number of bars on either side of the highest or lowest true high or low bar. It’s important to note that you decide what length of N you would like to search for. I’ve found that 11, 5, and 3 bar fractals typically highlight highlight all the important turning points. 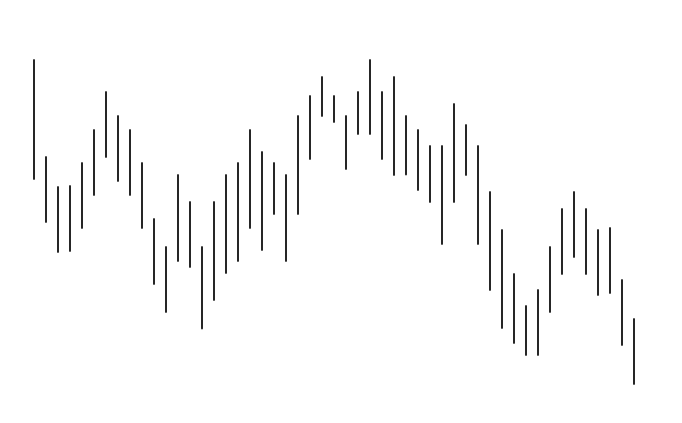 Now go back to our original example and identify an 11-bar fractal within the noisy data. 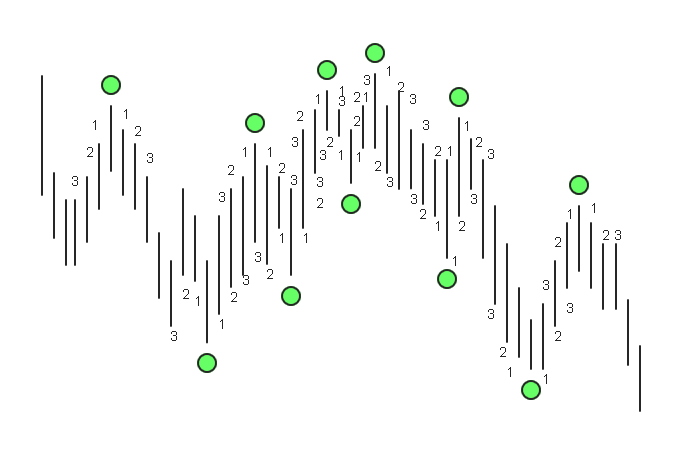 As you can see below, the 11-bar fractal identifies the major points on the chart. Note that the points on the far left and right of the chart are both potential 11-bar fractals but we do not have enough data to determine this. Now lets dial down to the 5-bar fractal and see that it uncovers one higher level of granularity. More turning points and shape are revealed. And then we can look at the 3-bar fractal and see that it identifies almost every meaningful micro move in the chart. This is a very easy and standardized way to identify and quantify the waves and turning points in the market. Can you think of any useful applications for this data? 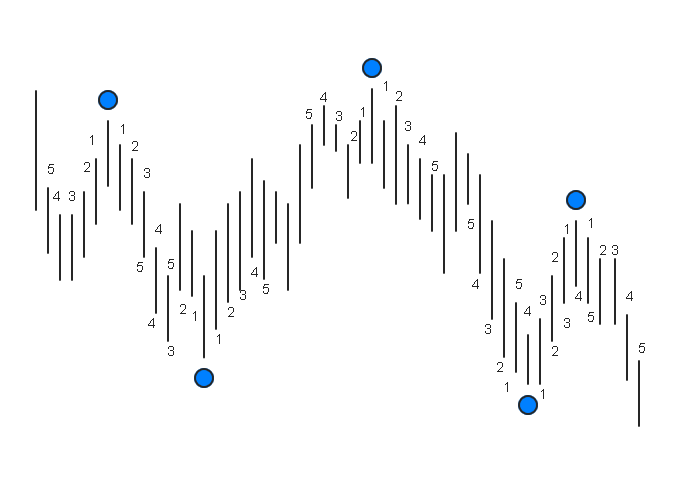 In the next fractals post I’ll share one way I utilize this data in day-to-day trading.